In some of the tourist places we visited in France I came across croque monsieur. 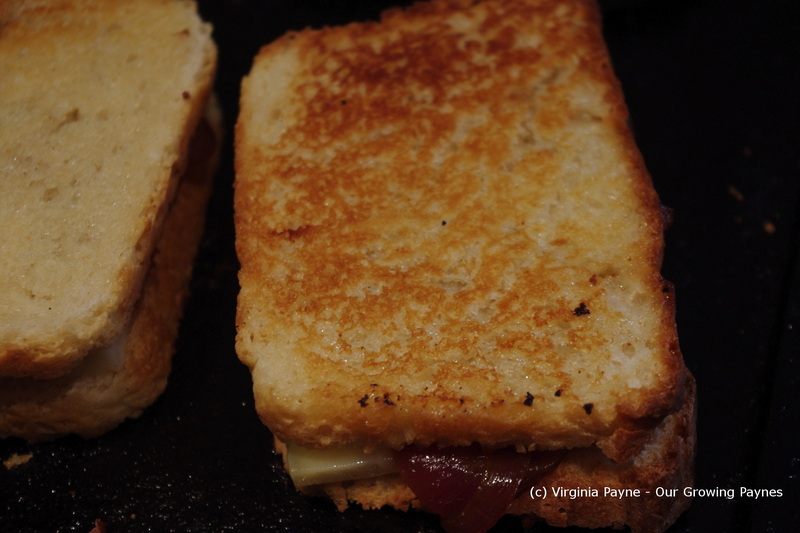 An inside out grilled cheese sandwich! The kids tried it and thought it was fun. 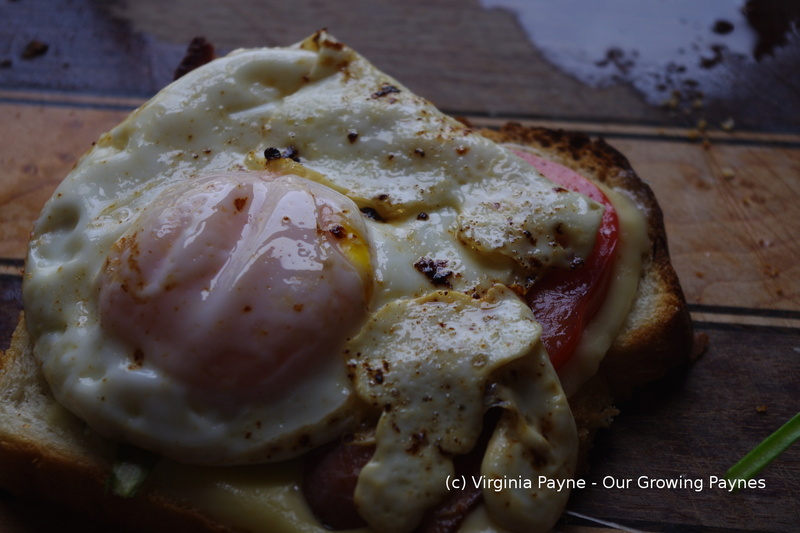 There are several recipes for croque monsieur, all pretty similar. 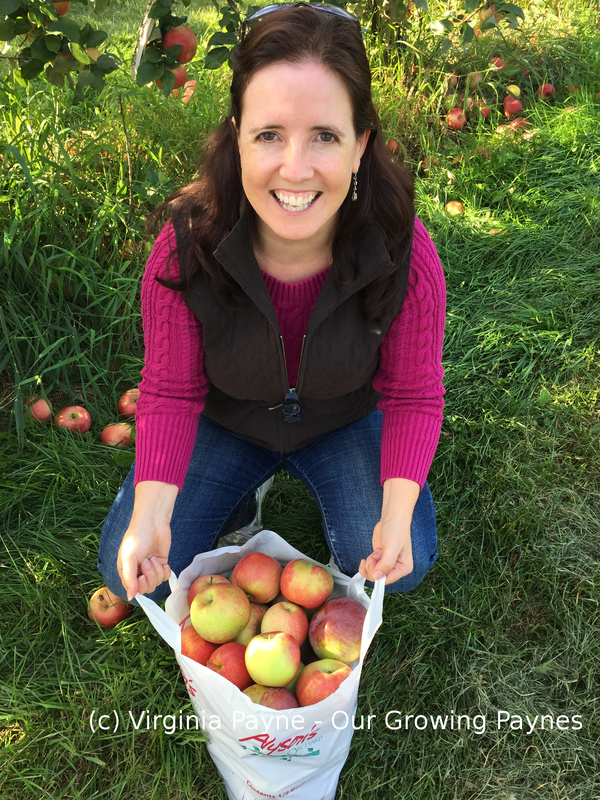 I used Ina Garten’s from Barefoot in Paris as a guide. I used our sourdough bread for this. I really didn’t want to use the soft storebought white bread she recommends. I just don’t like that stuff! I needed to make 4 sandwiches so I toasted the bread ahead of time. Also, prep 1/2 cup of parmesan and 1/2 cup of jarlsberg and set aside. In a small saucepan melt 2 tablespoons of butter then add 3 tablespoons of flour to the butter. Keep it on the heat and continue whisking to cook the flour. You don’t want the mixture to burn. Her recipe called for 2 cups of milk but I felt that was way too much. I decided to go with 1 1/2 cups of milk. We still had too much sauce leftover. Gradually add the milk to the flour mixture, again whisking the whole time to work out the lumps. With the heat on medium bring the mixture to a near boil. You don’t want to have it actually boil but you need it hot enough to thicken. Keep stirring to prevent the milk from scorching on the bottom. Once the sauce thickens remove from the heat and stir in the grated cheese. 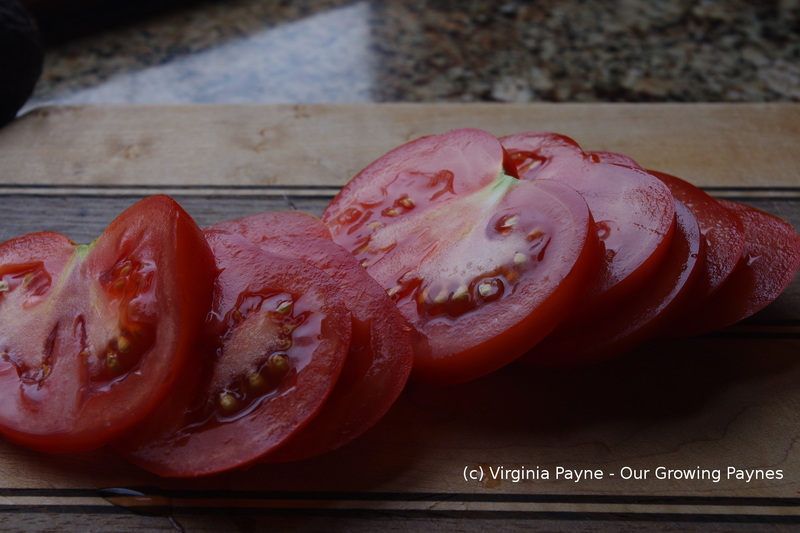 Dust the top with nutmeg and season with sea salt and pepper. Spread stone ground mustard of your choice onto half the slices of the toast. Add slices of ham and top with the other slices of bread. Then spoon on the sauce. Top with more jarlsberg cheese. Broil until the cheese is bubbly and golden brown. Serve with a side salad. I have to say as crazy as this dish sounded to me it was a lot of fun to eat and it was delicious. I do my best to stay healthy and eat well. You know, try to avoid clogging the arteries. But there are times you just have to go for it. Throw caution to the wind and indulge. I had seen variations on the theme of adding a fried egg to sandwiches so I thought I’d some fun with a grilled cheese. This is a BLT, bacon and egg, grilled cheese treat. I’d say I’d kept it somewhat healthy by adding the tomato and lettuce but who am I kidding! 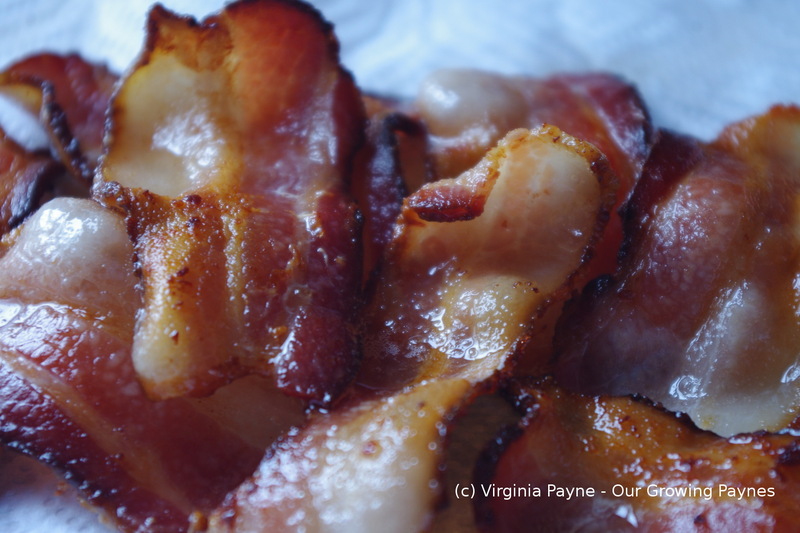 It’s amazing how the mention of the word bacon can light a fire under someone. My husband uttered the word and I’m not sure my son’s feet touched the stairs on the way down! After cooking up the bacon and making our dogs drool in optimism I fried my egg in the bacon fat. I love eggs fried in bacon fat but this is a very rare treat as it wouldn’t do a body good so to speak to have it too often. 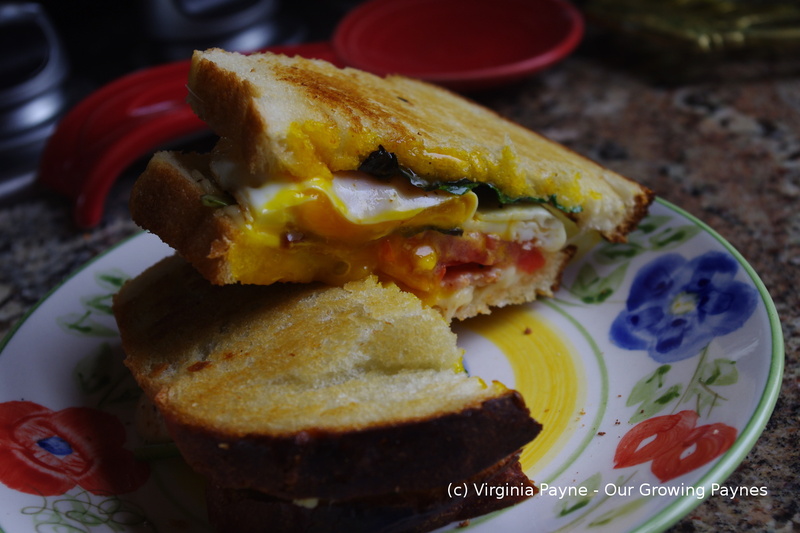 While the egg was frying we grilled the sandwich with jarlsberg cheese, the bacon, tomato, and lettuce. Don’t forget to butter the outside! Separate the sandwich and place the egg on one half, season with salt and pepper. Carefully cut the sandwich in half. I recommend doing this on the actual plate as the egg is runny. When Life Hands You Lemons Make Grilled Cheese! Thank you for those that watched my daughter’s episode, the feedback made her smile. 🙂 As you know the trick of adding acid to a dish was mentioned though the surprise was to add it to grilled cheese. Never thought of that. But I loved the idea. Of course I had to wait until the show came out so I didn’t spoil any surprises. Last night I gave it a go. When I asked what kind of grilled cheeses I should make our son piped up with ham and pineapple! Crazy kid but I said sure. I bought some fontina cheese to go with it and he loved it. 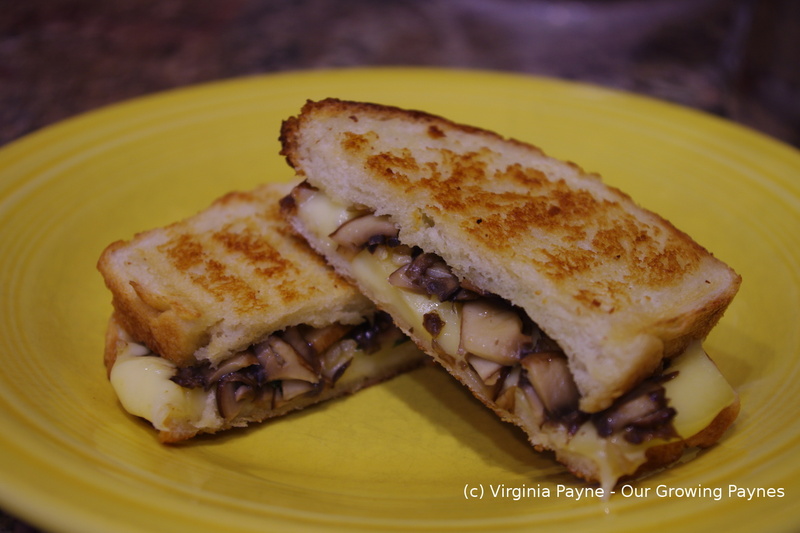 For the rest of us who aren’t as adventurous I thought I would do a mushroom grilled cheese. 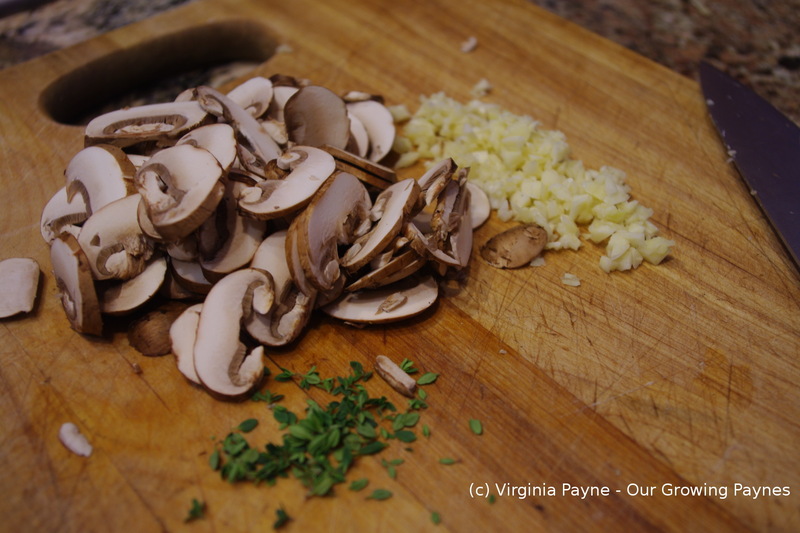 I slices up a few mushrooms, chopped about 3 large cloves of garlic, and prepped some fresh thyme. 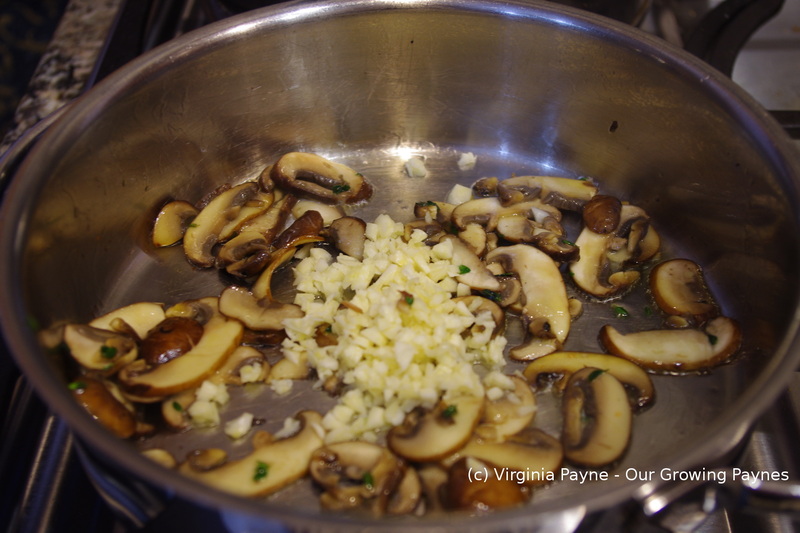 I heated up some olive oil in a skillet and sauteed the mushrooms first until they started browning. Then I added the garlic, thyme, and a few teaspoons of lemon juice. I think Luca likes to add a bit of lemon juice while you are cooking the actual grilled cheese but I wanted to incorporate it into the mushrooms. Once the garlic is cooked set aside until you are ready to assemble the sandwiches. We were also do sweet potato and regular potato fries to go along with the sandwiches and that bit can take awhile! Especially when we are using a saucepan to fry. 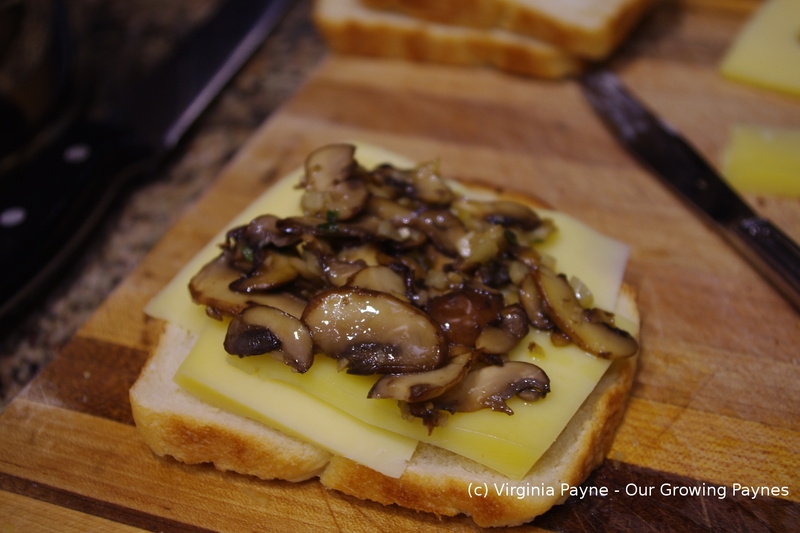 For our mushroom sandwiches I used Jarlsberg. Butter the outside of the bread and layer the cheese and mushrooms. We use our homemade sourdough for this. To grill we used our cast iron griddle and press. Make sure both are hot and cook until golden and the cheese is melted. My daughter and I added some ham to ours. This got a thumbs up and our son hopes we make his again as well. 😉 A fun dinner for a laid back weekend. Yesterday I mentioned having a chef’s equivalent of writers block. 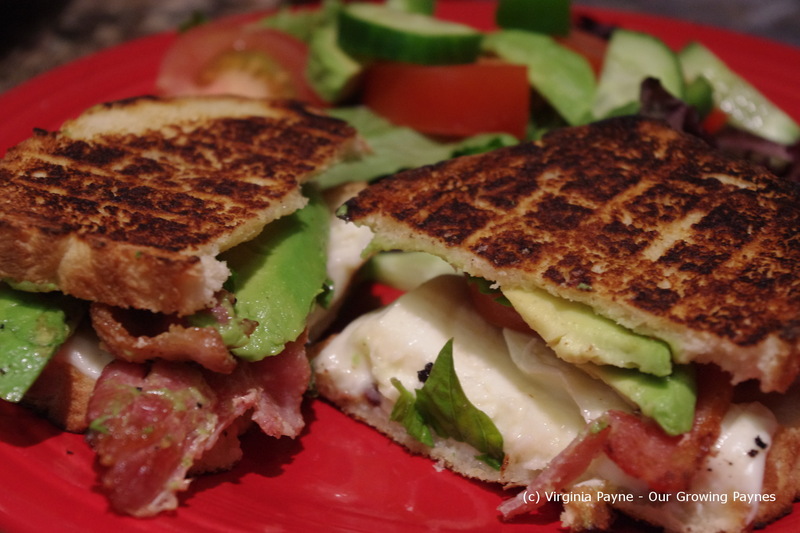 Finding grilled cheese recipes cured that malaise. 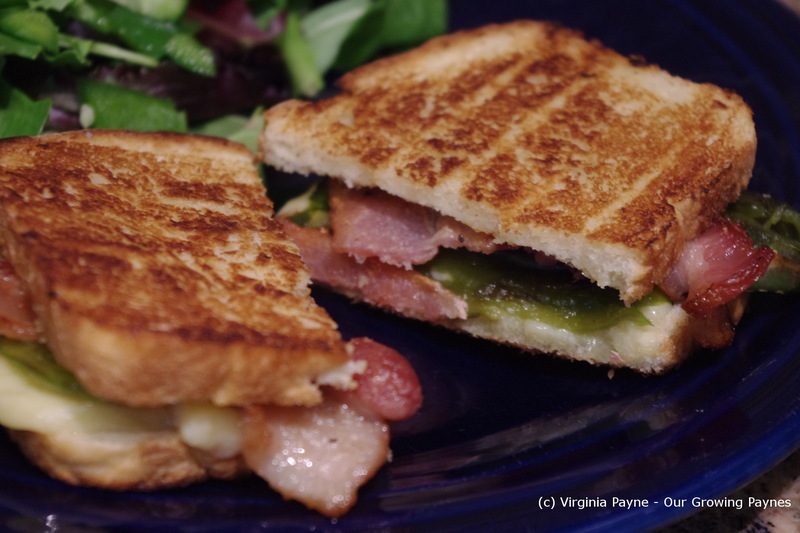 I made my husband the roasted jalapeno grilled cheese and made myself a lovely grilled tomato avocado cheese sandwich. I’ve seen several variations on Pinterest so I came up with my own as well. 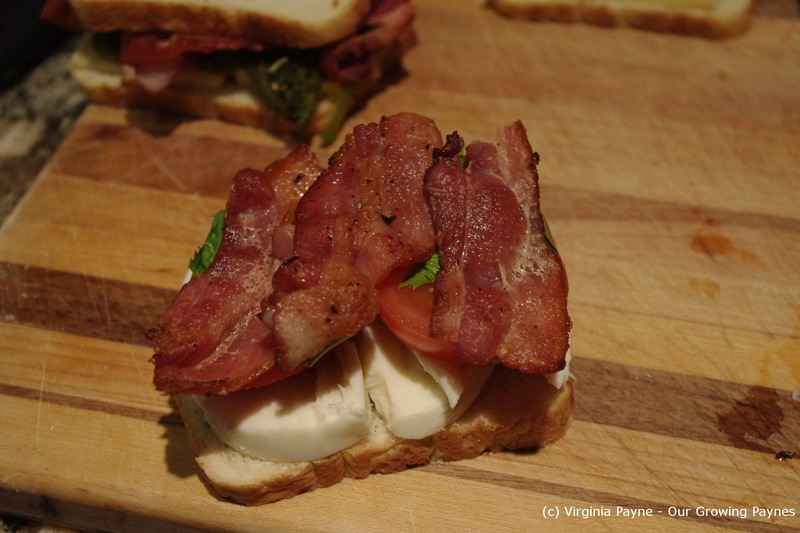 To start I used some of the cooked bacon I used on the other sandwiches and sliced up some mozzerella. You want this to be a bit firm but still creamy. I was lucky to find some organic avocado tucked away at the store. All I could find at first was regular and they were all rock hard. You could do some serious damage with those! Fortunately I kept digging and found some of the good stuff. Butter the outside of the bread. The bread I used for these sandwiches is our sourdough bread we make every week for the kids lunches. Grill to brown both sides. As this is a soft cheese you don’t need to keep it on the skillet for too long. You want it melty, not soupy. 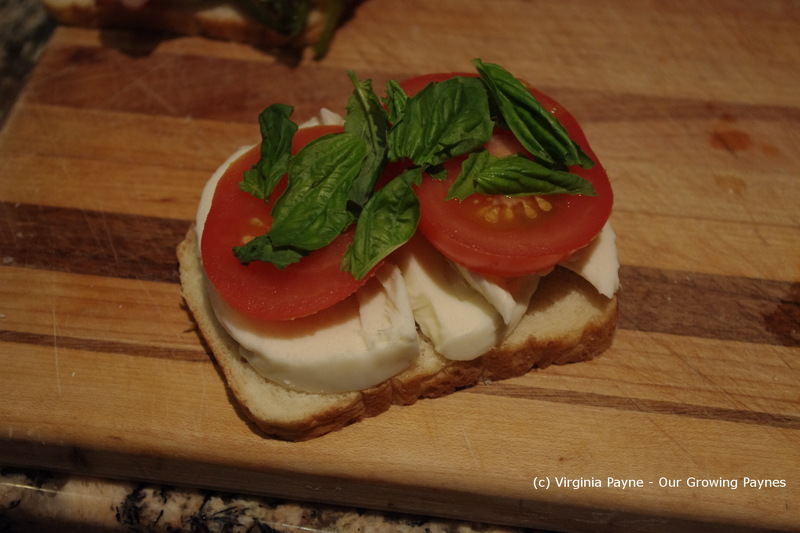 Serve with soup or salad and enjoy! Last week I was stumped about what to do for dinner. I didn’t want to do anything complicated nor did I want to do the same old thing. It was like I had writer’s cramp. I searched through my pins on Pinterest and finally inspiration struck. Grilled cheese! I made 3 kinds. 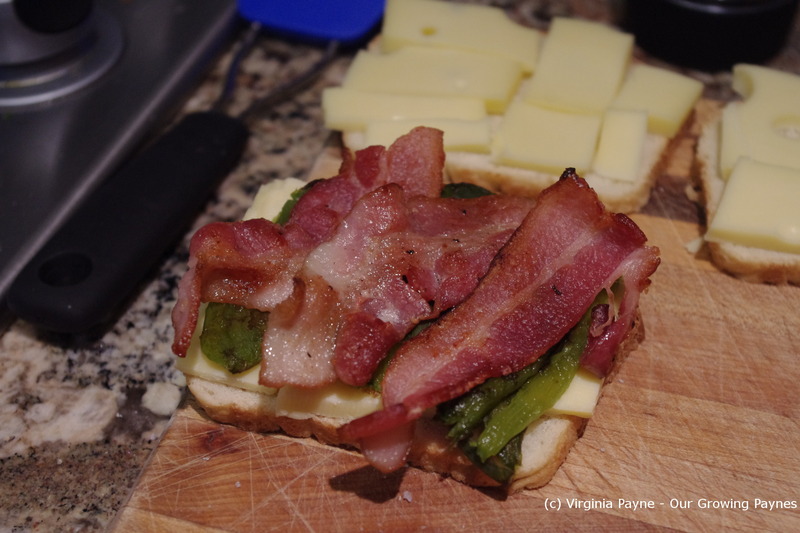 A Jarlsberg with bacon for the kids, another for me which I’ll post about, and then this recipe for my husband. All were served with salad. 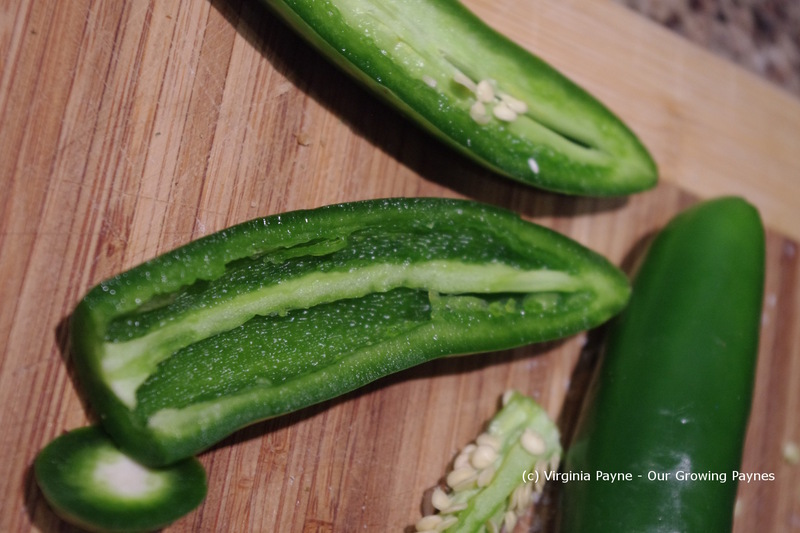 First I needed to roast the jalapenos. I sliced two and took the seeds out. 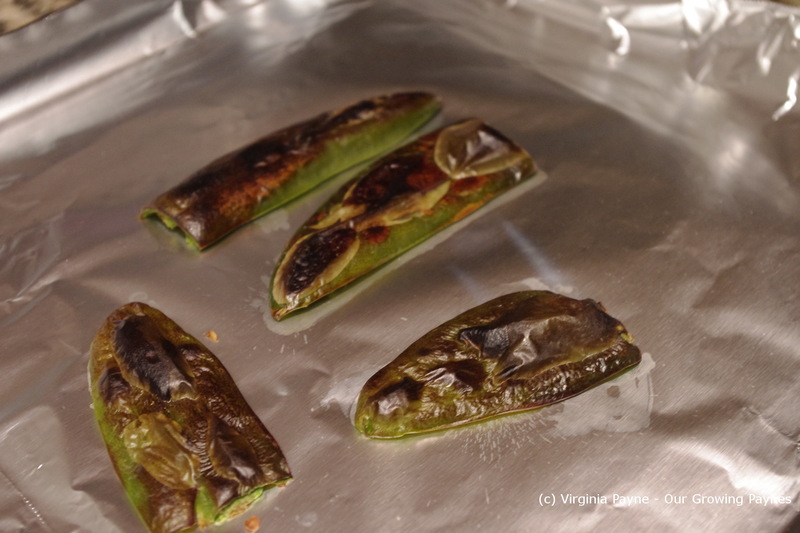 I placed them under the broiler until they blackened. 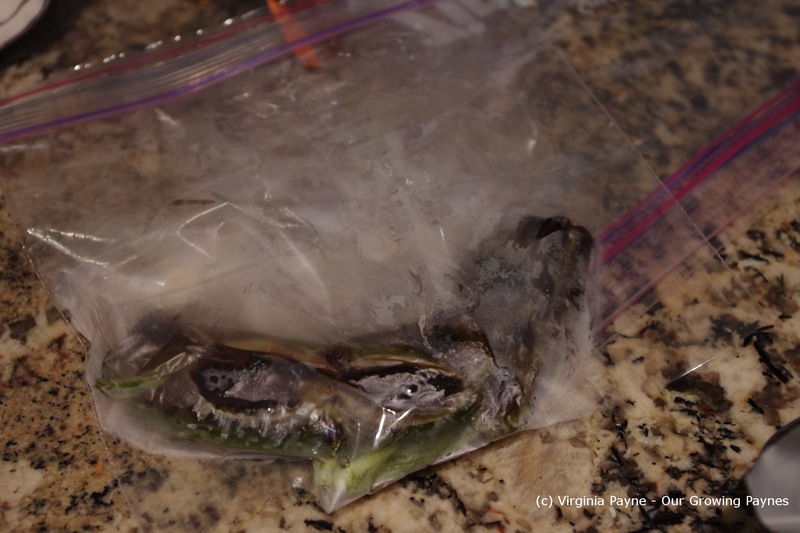 One tip from the recipe I found was to place them into a plastic bag to steam while cooling. 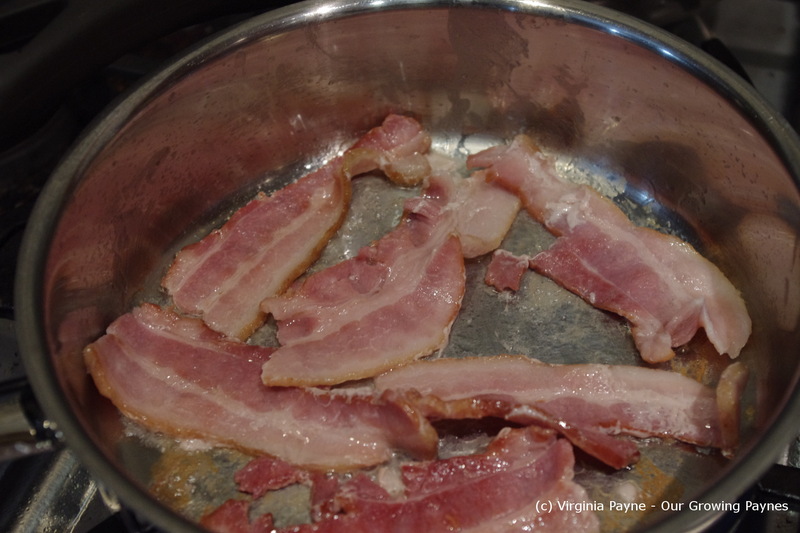 In the meantime I cooked up some bacon for the sandwiches. When the peppers cooled it said to pinch the skins and lift off. Right. Not so much. So either I didn’t broil them enough or whoever came up with this tip has been very lucky thus far. 🙂 I had to spend a few minutes peeling the skin off. It was a bit messy. I also used a good aged cheddar instead of goat cheese as my husband isn’t much of a fan. He’ll eat it but I know he likes cheddar better. 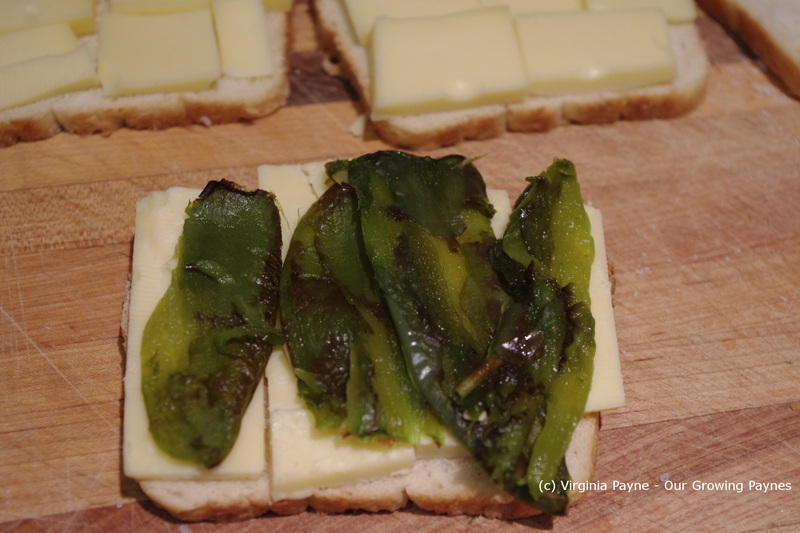 Place the jalapeno peppers over the cheese. 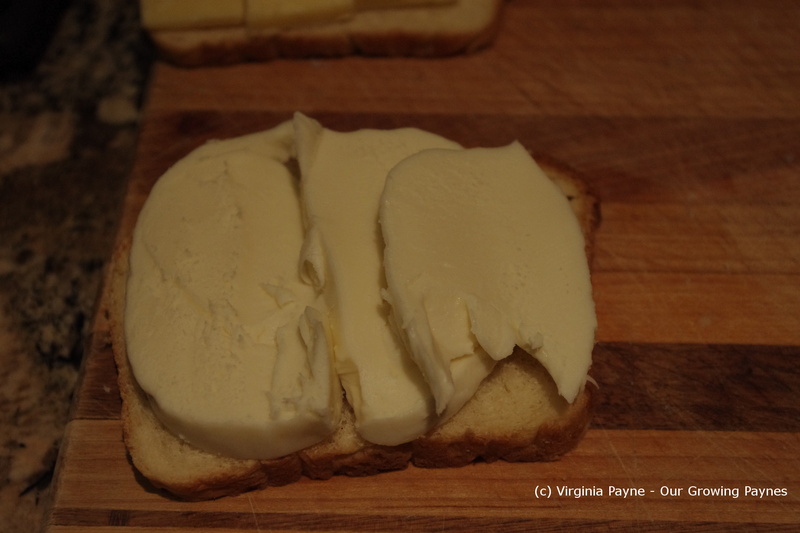 Make sure the outsides of the bread are buttered then grill them in the skillet. We have a hand held cast iron griddle press that we heat up and put on the top of the sandwich to heat both sides. Turn halfway through cooking. 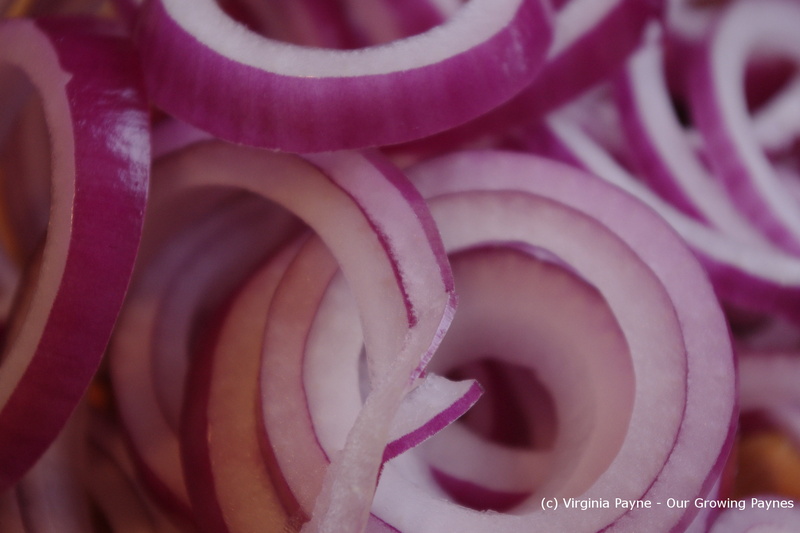 Remove from the heat and cut in half. It’s a bit of a roll of the dice on how much heat you get with this sandwich. I had to store buy the peppers given it’s winter so they didn’t seem to have the heat. I have a feeling if we used fresh grown ones they would have held up to the cheddar a lot better. 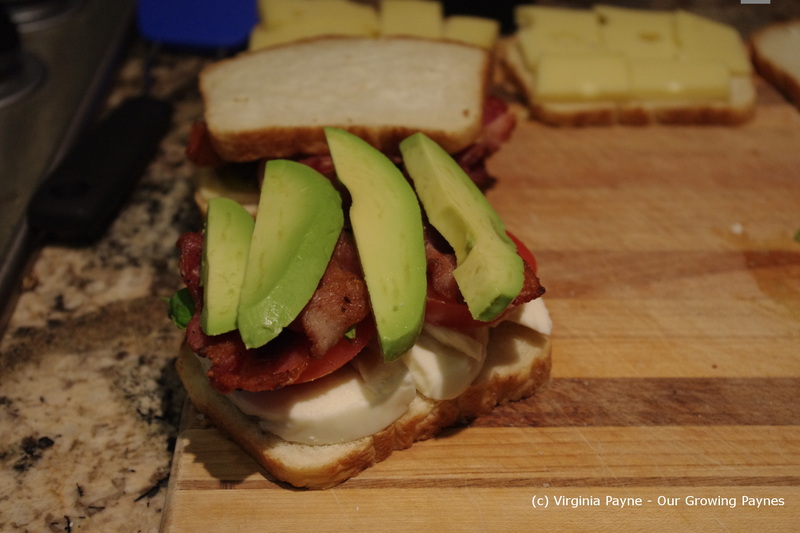 But my husband enjoyed the sandwich so I will make this again for him. Melt butter and saute the onions in the butter with the sugar until softened. Dissolve the bouillon into the hot water. 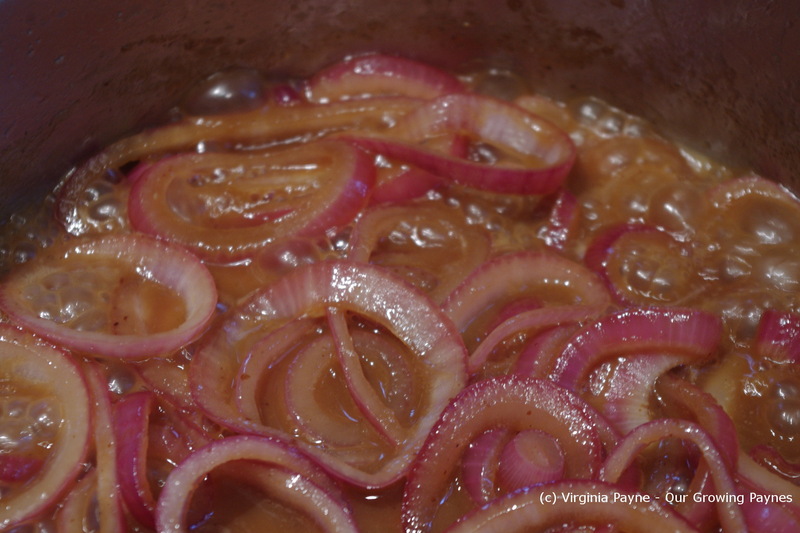 Traditional French Onion calls for beef bouillon but I like the veg version for a more layered taste. 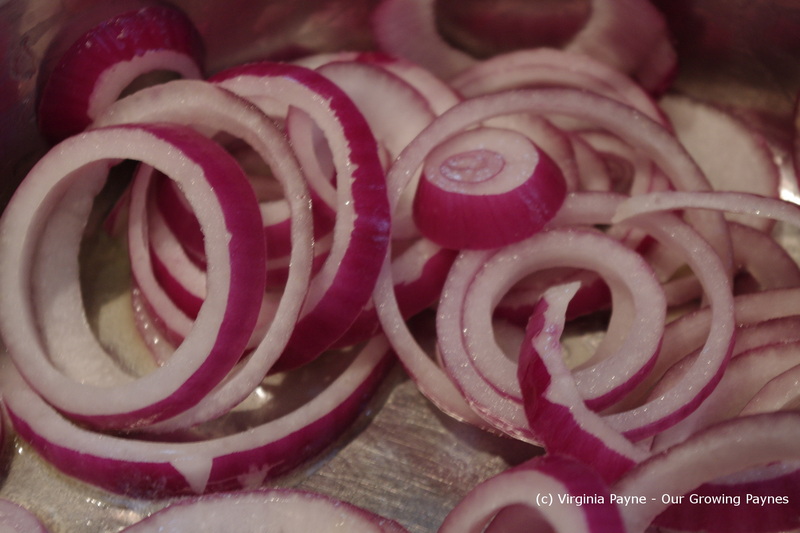 Add to the onions and bring to a simmer. Add the Worcestershire sauce and cognac and cook down until the sauce is reduced. Slice the bread and butter the outside of each slice. Place slices of cheese of your choosing onto the bread. We use jarlsberg for most dishes that require some sort of swiss but that is our preference. 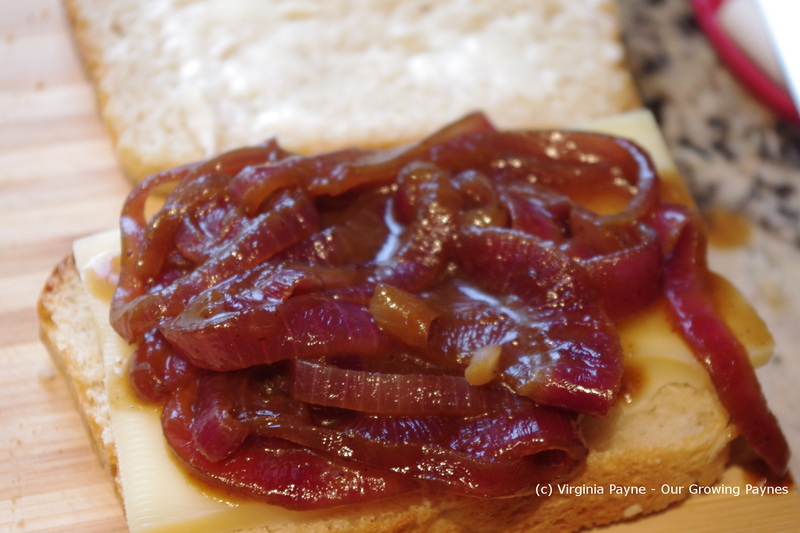 Spoon some onions on the cheese and top with the second slice of bread. Grill on the griddle or frying pan until the cheese is melting. Serve immediately. This meal only takes about 30 minutes to make and goes down a treat.